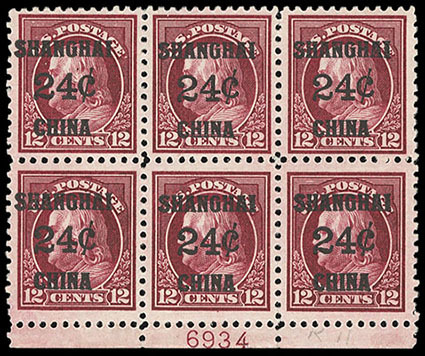 Offices in China, 1919, 24¢ on 12¢ brown carmine, bottom margin plate no. "6934" block of 6, o.g. top center stamp l.h., others n.h., couple light natural bends, bottom left stamp with tiny Stolow handstamp, Extremely Fine and choice. 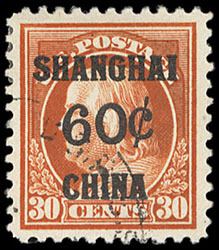 Offices in China, 1919, 60¢ on 30¢ orange red, light town cancel, rich vibrant color, wide margins, Very Fine.